Male purple-crowned fairy-wrens use their purple crowns to show off about their social status and strength, according to a new study by Monash biologists published today in the Journal of Animal Ecology. Some male birds seasonally produce a brightly coloured nuptial plumage to attract females at the start of the breeding season. Researchers studying the male purple-crowned fairy-wrens say that despite being faithful to their partners, these birds take the trouble every year to change their head colour from dull brown to a stunning combination of purple and black plumage. 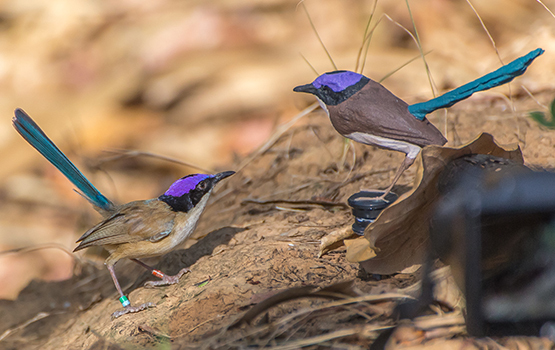 “These showy males actually use their purple crowns to signal social status and competitive strength to other males,” said study author Associate Professor Anne Peters, from the Monash School of Biological Sciences. The study’s lead author, PhD student Marie Fan, supervised by Associate Professor Peters, studied the role of the nuptial plumage in competitive interactions among male purple-crowned fairy-wrens. Resident breeder male purple-crowned fairy-wren investigating a 3D-printed model representing a male intruder in nuptial plumage in his territory. Photo credit: Laurent Lermusiaux/AWC. “They strongly resemble other fairy-wrens, that all develop seasonal attractive plumages,” said Marie. Purple-crowned fairy-wrens form family-like groups living in well-defined territories, each owned by a dominant breeding pair accompanied by subordinate helpers. Acquiring and defending a dominant breeder position is therefore critical for male reproductive success. By closely following marked individuals over six years, researchers established that ‘prettier’ subordinates – males with more developed purple crowns – had more success in contests for breeder positions. The researchers also presented life-like 3D-printed models of males painted in purple or dull colours to resident males, and observed the behaviour of the territory owners. “When resident breeder males see these models, they perceive them as intruders, and their aggressive behaviour – how long they interact with them, how close they approach and how much they sing – tells us how big a threat these models represent,” said Marie. Associate Professor Peters, said that what made these results so interesting was that, based on what we knew about the evolutionary history of fairy-wrens, purple-crowned fairy-wrens probably had higher levels of infidelity in the past and used their nuptial plumage to attract extra-pair partners, much like what we observe today in other fairy-wrens. “What this means is that this very attractive nuptial plumage may have switched from one function – attracting females – to another – deterring rivals – when there was a radical change in sexual behaviour,” Associate Professor Peters said. The study shows that the function of plumage ornaments in attracting mates or repelling rivals may be gained or lost independently, offering some new explanations for the great diversity of brightly coloured plumages seen in birds.